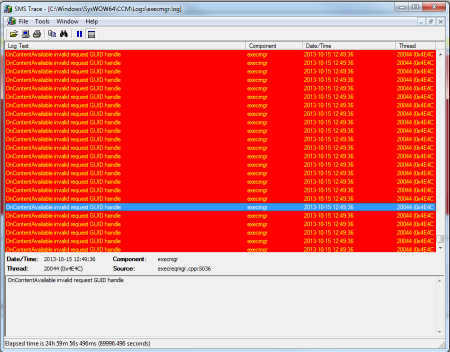 Execmgr.log on the client will display lots of “OnContentAvailable invalid request GUID handle”-messages. There’s a folder in C:\Windows\SysWow64\CCM\Logs called SMSTSLog. This is left here because the TS is still running. 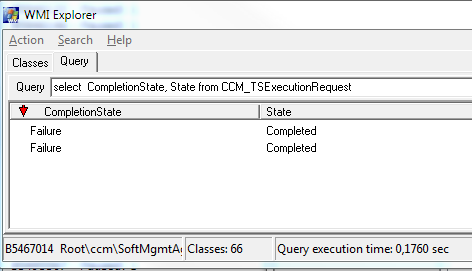 If you open the logfile you’ll se that the TS has hung while “Pausing CCM Component SoftwareUpdates”. The Task Sequence will be “Completed” if you look at it with SCCM Client Center. 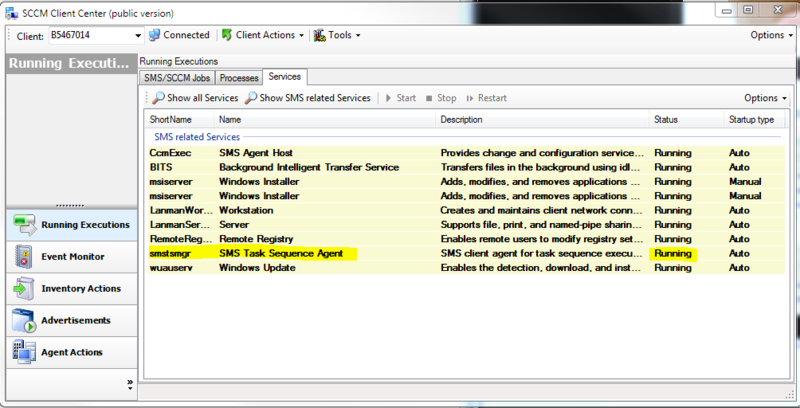 The screenshot above is from the excellent tool WMI-Explorer. Some notes on the script. I’ve tested it pretty well but use it on your own risk. The script Checks for a running TSManager and kills it on the client. It’ll also check for paused software distributions, left over SMSTS-folders and it’ll clean the computer of old TaskSequences in WMI that are in a limbo state. With the /Checkall flag you need to edit the script to enter the name of your SCCM Server. The script will create three files; A log file, a file called CheckedComputers.log and a file called DoesntAnswer.log. The two latter files are used to remember which machines have been checked in case you abort the script. If you have any questions, please ask them below. Question: If I want to just CHECK which other computers in my fleet have to problem but don’t want to FIX it on all at once using your script……is there a query I can run that will just show me computers in the stuck mode that have faulty TS in their cache? Check your mail and let me know if that script works for you! Thanks for this script! How would you go about modifying it to add output to the log if the process was not detected or the folders were not present? My VB Script isn’t strong! See this code in the script? Add the same “Else”-clause for the function called “KillTSProcess”. Be careful if you cut & paste this code, the quotation marks can end up in the wrong way. Would it be possible to get a “Check only” script like Jon previously mentioned. This script just worked wonders for me on a known computer with the issue, but I would be curious if I can find any others in the environment without necessarily running the fix on them at this moment. Thanks for the already awesome script! Hi Mathias, your script is great and help, but as I have no VB scripting experience would you be able to help in amending the script to run from SCCM 2007 program and output a 0 code if it runs and finishes. We would like to run this from a package that is deployed via SCCM, thanks in advance for you help, I am sure that other people would like to use this also. The script worked on a Sccm 2007 client. I have two pcs and dont’ appear in the configuation manager console. I’v been looking what is the razon. Those pc has installed the client for sccm 2007. but i can’t see them. they are Win XP Prof SP3. At the control panel i saw the configuration manager client. I push the inventory software cycle option in Actions, but don’t appear in the configuation manager console. The other one is worst, i press the icon configuration manager client in the control panel and don’t show anything…please help..
Great info. Ive seen this paused state error of late and while i found the reg files this script will be very handy. Do I simply runit as a cmd line function from a TS. I am a total Noob in sccm. I suddenly have a lot of issue where things where going smoothly. We did some “house Keeping” and obviously hosed something but I can push a package still but getting this paused state error as if its looking for updates. Failed pausing ComponentController for Software Updates. 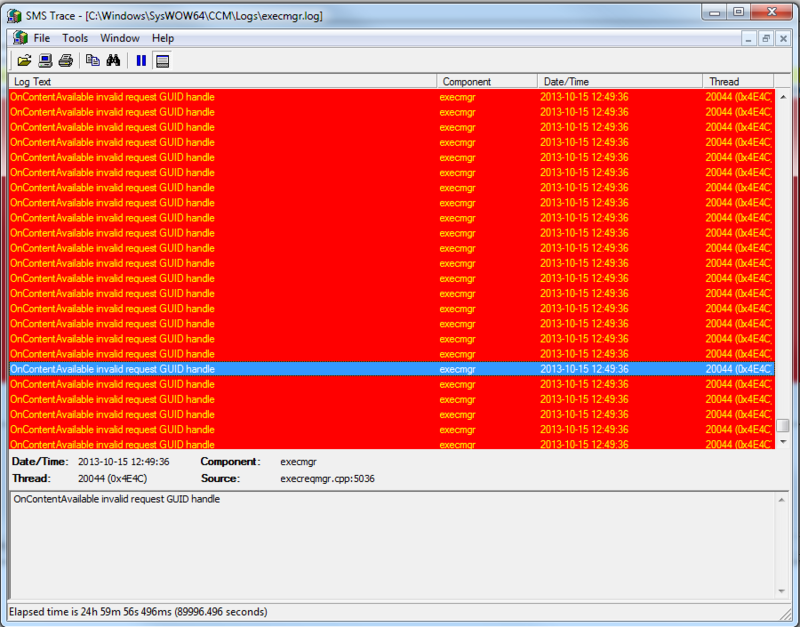 I’m trying to locate all SCCM 2007 clients in a particular site that have the ‘paused’ issue. I’m using the ‘check only’ version of the script. I’m not able to get the /checkall switch to work. I’ve entered the SCCM server name in the script as required. If I enter a single computer name as a switch it runs, but not with /checkall. Any idea why? Thank you so much for the ‘fix’ and the quick response Mathias! Looking forward to trying it out tomorrow at work. Oh one other thing. It appears the ‘registry’ section of the script only accommodates 64 bit systems. Are you able to have it support both 32bit and 64bit systems? Does this apply to SCCM 2012 as well? Hi, it is possible to use this script for a différent computer in a text file. For example : cscript.exe CleanComputerFromBadTS_v1.7.vbs computers.txt (who contains a list of computers). Thanks you very much for your great script. Where should this script run from? From the primary server or Cas? Is this a manual action or should i create a package to run it on 1000 computers? I have actually the same problem with computers hanging after a installation in the TS failed.